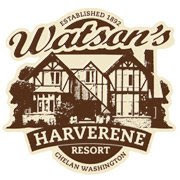 At Design Hovie Studios we just completed the new brand id and apparel for Watson's Harverene Resort on Lake Chelan in Chelan Washington. The new brand showcases the lodge and includes the rustic, tranquil qualities of the resort located in one of Washington's most picturesque settings. For those interested in experiencing this amazing place first hand, check out their site and make a reservation.